Low interest rates threaten banks and savings&loans institutions – so? … die Branche weiter gegensteuern müssen und über neue Lösungen und andere Geschäftsmodelle nachdenken müssen. In the context of low interest rates banks (those that guaranteed high interest rates on deposits and now are experiencing problems with low yields) would “have to turn the steering wheel around and think about new solutions and business models”. While this kind of message is often presented as a problematic one, I think that it is absolutely not. In a capitalist society, a private sector business model that does not deliver profits should lead to firm exit. Banks that promise high interest rates in deposits are speculating on higher interest rates in the future. If these do not materialize because (surprisingly?) we still have no hyperinflation as a result of ECB and Fed policies – so what? You placed a bet on a loser, based on a failed economic theory, which is neo-classical economics. Others placed their bets based on other theories and are doing just fine. (Did I mention that Jan Hatzius of Goldman Sachs uses Post-Keynesian reasoning?) 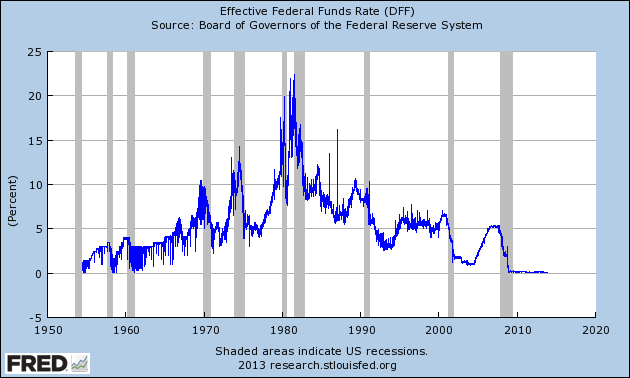 Any by the way: given the data on the Fedfunds rate, what can you have seriously expected? We had falling interest rates since 1980, because in every recession monetary policy was used and interest rates never returned to the higher pre-recession levels. So, we should be witness to a process of creative destruction as some banks do understand how the financial system works, zero interest rate policy and all that, while others are completely confused about the state of the world (hyperinflation!). What we really need is that some business models are not “profitable” anymore, which are those that lead to private gains and then social losses as the weak link is bailed out by the tax payers. This happened in Wall Street with the sub-prime mortgages which were only tradable because of credit default swaps issued by AIG, whose impeding bankruptcy led to a $180 billion bail-out.